Street furniture is something that often attracts the eye and sets people wondering. When we visit a different country we are immediately drawn towards the little differences that throw us out of our daily routines. These are also the features of a country or city that help to give it its identity; yellow taxis in New York, red phone and letter boxes in the UK, and - subject of my latest challenge - green pharmacie signs in France. "Why are they green? Why a cross? When did this convention start? And who makes the new ones with the flashing lights, and programs them so that it seems no two have the exact same pattern and motion?" Since when has this been in force? And who makes and programmes these signs? I will answer all of these but not in this particular order! The easiest question to answer is when did this convention start. 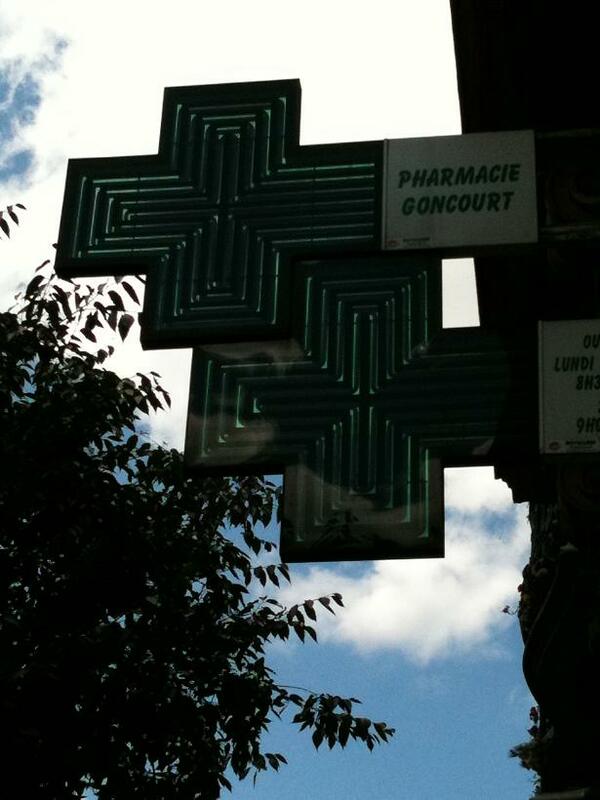 The green cross as symbol of the Conseil National de l’Ordre des Pharmaciens was registered in 1984. Although owners of pharmacies are not obliged to use this symbol, the registering of the green cross meant that no-one else working in a similar profession could use it. Why though did they choose this particular shape and colour? The cross is obviously a reference to the 'Croix-Rouge', the international humanitarian movement set up in Geneva in 1864 with the goal of assisting those injured in wars and conflicts. 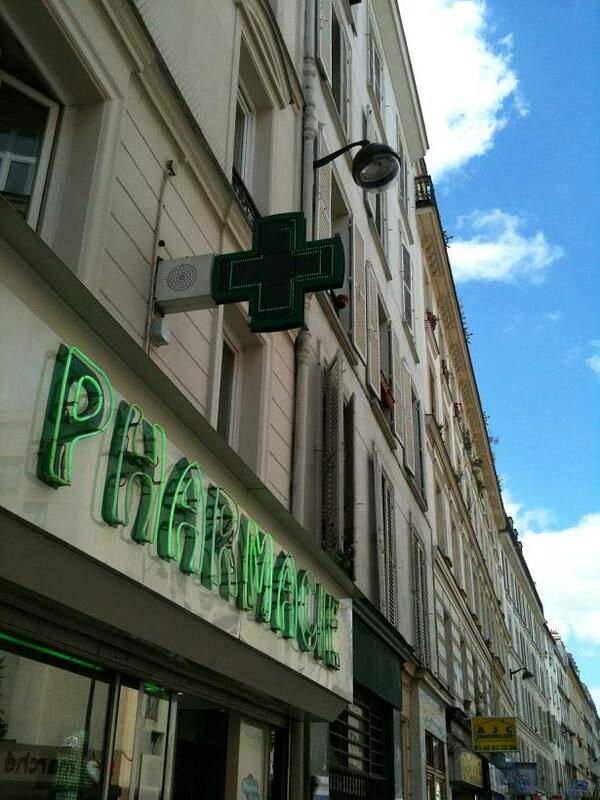 Indeed, many pharmacies in France did originally display a red cross on their shops, up until 1913 when a law banned such usage of this symbol and colour. 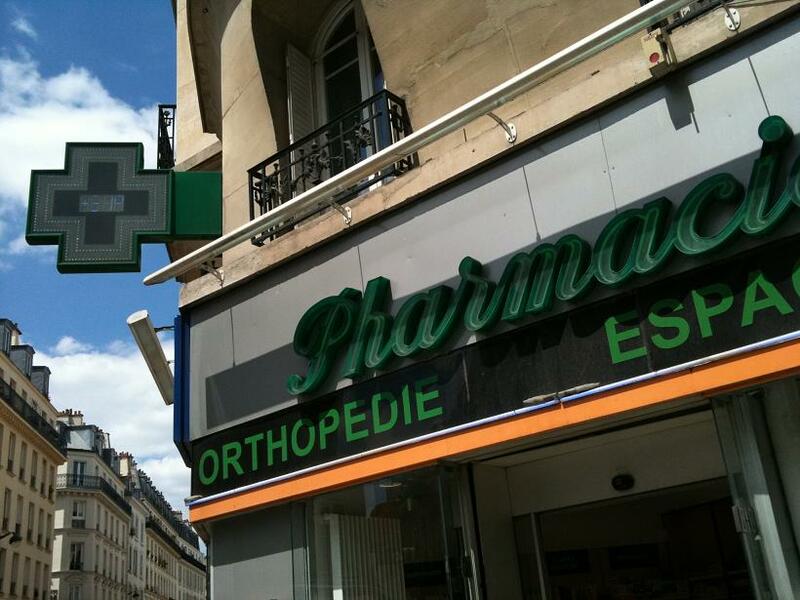 The association of 'pharmaciens' in France needed their own colour, but why did they choose green? There is no clear answer to this particular question, although most sources seem to agree that it simply makes a link to the plants that are used in the fabrication of the remedies they sell. The colour is though particularly well chosen as it works very well on a neon sign in daylight! But what about these neon signs? Who makes them and why are they seemingly all different? A quick spin on the web throws up one manufacturer, and also provides an answer to the second question too. This particular company, based in the Paris region, sells three different models, each of which is programmable via a supplied piece of software offering dozens of different animations. Which leads me to a question of my own. If these signs are programmable, why has the sign on the pharmacie opposite my apartment shown the wrong time for the last five years? Well done Adam. 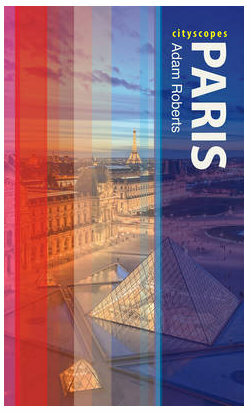 Nobody digs deeper into the depths and hidden mysteries of Paris than you. 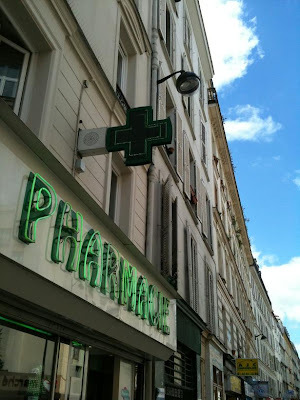 Is it true that France has more pharmacies per head of the population than any other European country except Germany? I have three within 50 metres of my apartment! Brilliant! (As always.) I had seen the green crosses before 1984, so I was surprised to learn how recently they had made the symbol official. Excellent sleuthing on your part. Thanks! Interesting information! What especially strikes me is the number of green crosses. I believe there are ten within two minutes walk from where I live. I compare with Sweden and the city of Gothenburg (where I was born), where I think there are three or four pharmacies for a population of 500.000. And those signs are very protected by law. When brainstorming what was to turn out to be a couple of modest restaurants (of American breakfast theme) we dreamt of an old Times Square light sign extravaganza: a giant egg cracking open up at the 6th floor, the insides falling the height of the building to land splat in the giant lightbulb frying pan as two fried eggs-perfect would have been a puff of smoke then emanating with a synthesized sizzle (OK, incandescent light relay sequence... but). Out of the question, no lights can compete with pharmacy green lights, for fear they will end up with fried eggs rather then aspirin. They are also green in Italy. Why is it so? Ah, if I have to answer questions about Italy too now this could get tricky! I would guess that they are green there too for much the same reasons as in France, but if anyone has more information, feel free to add it here! The green cross was the symbol of the Order of Saint Lazarus, a knighly order set up during the crusades (much like the Templars and Hospitaliers) and whose missions were to uphold the christian faith and fight leprosy. Because they fought leprosy, their symbol became associated to the pharmaceutical profession in many countries, not just France. I'm pretty sure it has nothing to do with the red cross. But why the variations? When I was last in France I delivberately made a point of spotting all the pharmacies and not one of them was identical - amazing, but how and why? I wanted to write this answer, and roled down to find if someone already give the right answer as you.